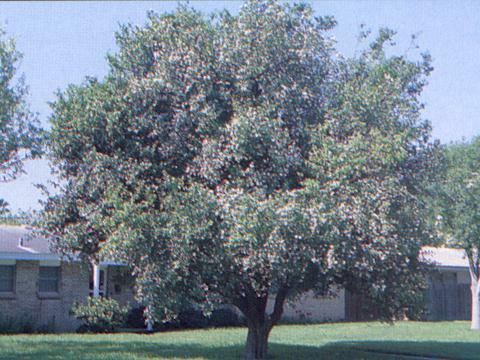 Flowers: Fragrant, white, clustered near branch ends; early spring and after summer rainfall. 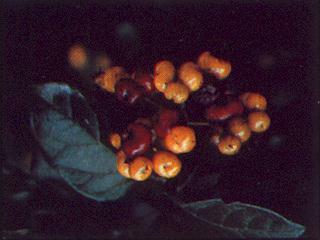 Fruit.- Edible, yellow to red two-seeded berries. Foliage: Evergreen, dark-green, rough like sandpaper. Bark: Thick, furrowed bark, gray to reddish-brown. Sun: Full sun to shade. Soil: Any; best in alkaline soils. Water: Low to moderate; drought tolerant after established. Avoid planting over heavily-traveled walkways where fruit would be crushed; generally not subject to disease. Propagation: Seed, root suckers. Wooded areas near rivers and resacas. 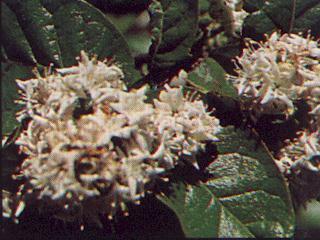 Flowers heavily used by butterflies and bees; fruit by birds; cover, nest sites. Deep shade; spring blooms look like the tree is covered with snow; unusual mature trunks look like several corded trunks have been bound together.